SMS Template for Android App with AdMob Created by vishalbodkhe. This templates have specific characteristics, namely: DescriptionSMS Template can be used by Android Developers for providing the design and good implementation on SMS app for creating own SMS app or to the . You can use this SMS Template for Android App with AdMob on Mobile category for communications, love sms, message template, messages, sms, sms app template, sms template, text message and another uses. 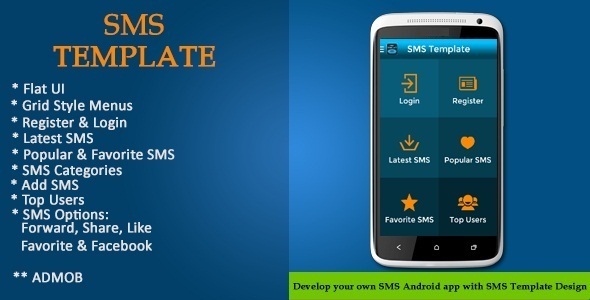 SMS Template can be used by Android Developers for providing the design and good implementation on SMS app for creating own SMS app or to the employers. Template will provide you the design and screens flow ready for Android app only need to get SMS and SMS related contents from web server, cloud or from any database. Developer only need to get the related contents from database to show the list of sms. One will need website for SMS contents and it’s users and then this app can be useful to create app for Android. Right now the template will provide all the hardcoded sms and contents from content manager class that have written in code. Admob banner ads added in most of the screen only you need to put Admob id to see ads on your SMS app once ready with actual contents. Easy to change the colors/graphics, by simple replacing the color code and images, app logo and name of app. Important Note : SMS Template needs live/actual sms contents and this can be done by Android developer, this item is not for ready to launch/use live. If you have question, please first visit the Support Tab for more information and FAQs or contact me via contact form provided in this site. Before purchase this item please read item features and details what item is providing like is App Template or full app.If you have any questions/doubts in mind about the item features and working, please contact and ask. I will be more happy to clear your doubts.